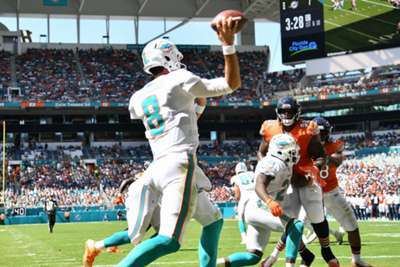 The Miami Dolphins escaped Sunday's NFL matchup against the Chicago Bears with a 31-28 victory in overtime as rookie Jason Sanders kicked a 47-yard field goal. Chicago had a chance to score in overtime, but Cody Parkey missed a 53-yard field goal attempt that went wide right with 1:55 seconds remaining in OT. The Bears also turned the ball over twice. Quarterback Mitchell Trubisky threw an interception in the end zone and running back Jordan Howard fumbled the ball at the goal line. Even though the Dolphins walked away with the win, Miami had another chance to score earlier in overtime. The Dolphins were close to scoring on third down at the one-yard line when running back Kenyan Drake fumbled. Miami's victory came behind Brock Osweiler, who threw for 380 yards and three touchdowns in relief of Ryan Tannehill, who missed the game with an injury. The Dolphins are now 3-0 at home this season for the first time since 2002. Miami improved to 4-2 in 2018, while the Bears fell to 3-2.